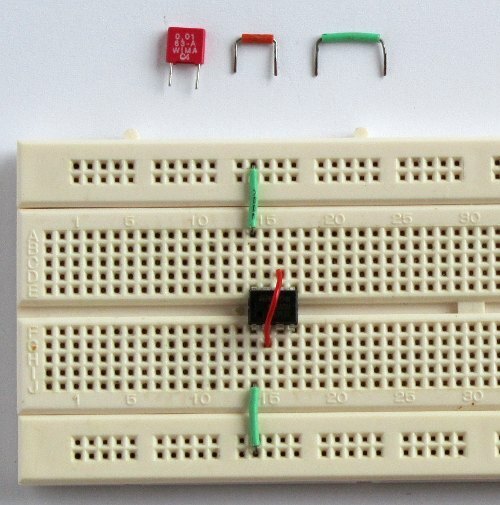 A 555 (triple five) timer IC (integrated circuit) is used in this tutorial to flash an LED on and off. 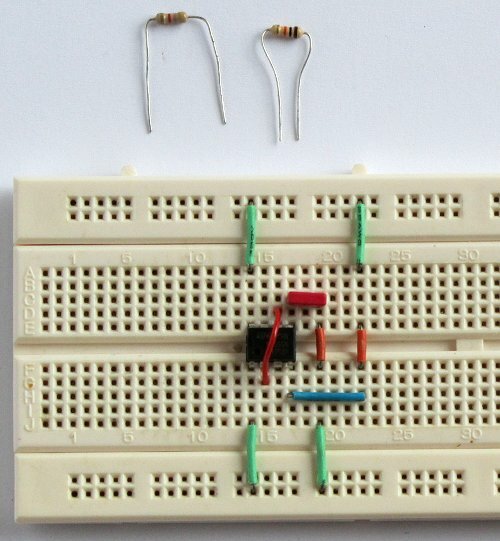 Complete tutorial 2 and read about integrated circuits. The connection point for the positive terminal of the 9V battery is displayed as a circle at the end of a line with the label "+9V". This is just another way of showing where to apply power to the circuit. 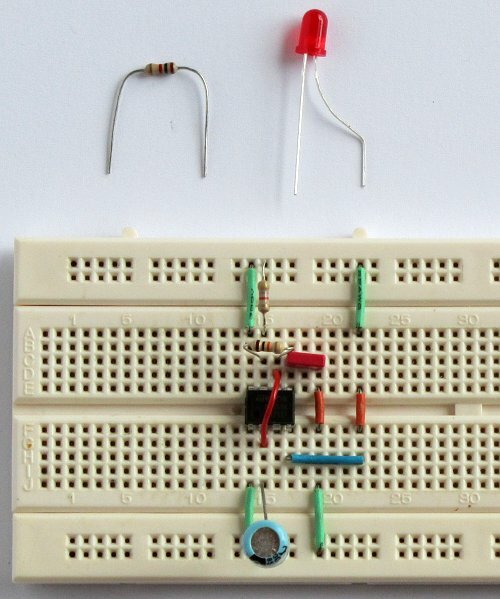 The 0V or "GND" of the circuit is shown as an inverted triangle at the bottom of the circuit. This is where the negative lead of the battery must be connected. The schematic symbol for the 555 timer IC is not drawn to the layout of the physical 555 IC. I.e. it does not have pins 1 to 4 on one side and pins 5 to 8 on the other. Schematic symbols for IC's are often laid out differently to the physical IC. This makes it easier to read the schematic diagram. Even though the pins are in different places in the schematic, they still have the correct pin numbers and names as the physical IC. 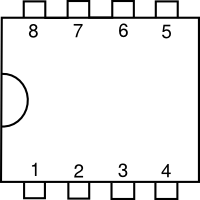 This picture shows a top view of the physical 555 timer IC with pin numbering. Compare it to the schematic symbol. 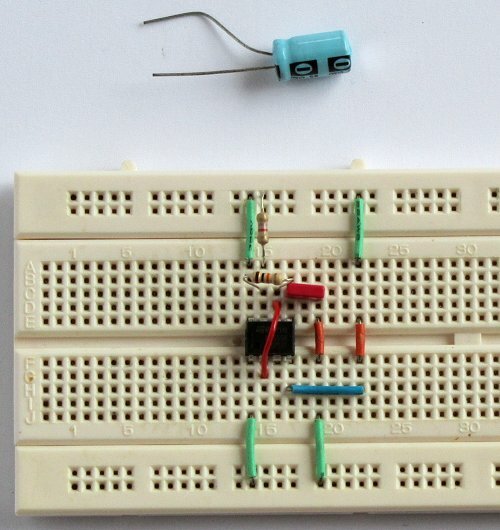 Plug the 555 timer IC into the breadboard across the middle insulating channel. None of the IC's pins will be shorted out because of the middle insulating channel. Using wire links, connect pin 8 of the IC to the top rail and pin 1 of the IC to the bottom rail. Get a wire link ready to connect between pins 6 and 2 of the IC. Use the wire link to join pin 2 of the IC to pin 6. Get the 10nF capacitor ready and some wire links. Connect one pin of the 10nF capacitor (C2) to pin 5 of the IC and the other pin of the capacitor to the bottom rail. This is done using two wire links in the photo. Get wire links ready to connect pin 4 of the IC to the top rail. Use wire links to connect pin 4 of the IC to the top rail. In the photo, three links are used to do this. Get resistors R1 (4k7) and R2 (10k) ready. Connect the 10k resistor (R2) between pins 6 and 7 of the IC. Connect the 4k7 resistor (R1) between pin 7 of the IC and the top rail. Get the 100uF capacitor ready. Connect the positive lead of the 100uF capacitor (C1) to pin 2 of the IC and the negative lead to the bottom rail. Get the LED and the 1k resistor ready. 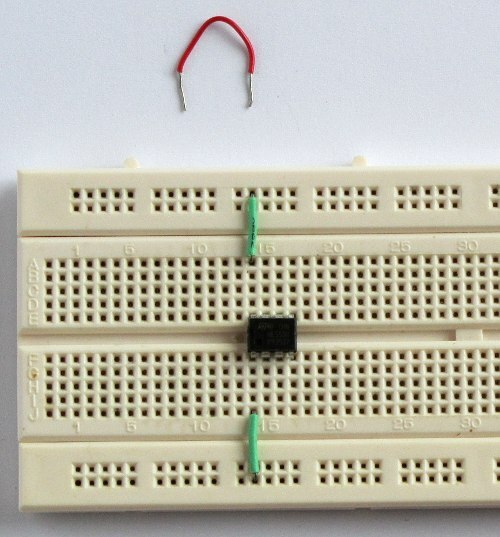 Connect the 1k resistor (R3) to pin 3 of the IC. 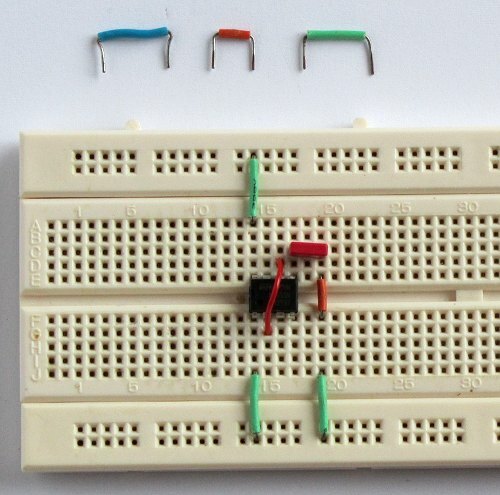 Connect the other pin of the resistor into a free connecting strip of the breadboard. Connect the anode of the LED to the free end of R3 and the cathode of the LED to the bottom rail. 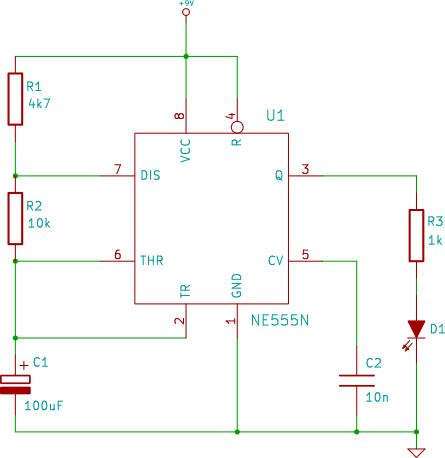 Check the circuit that you have built against the schematic diagram. Go around the IC and check that each pin is connected to what the schematic says it must be connected to. 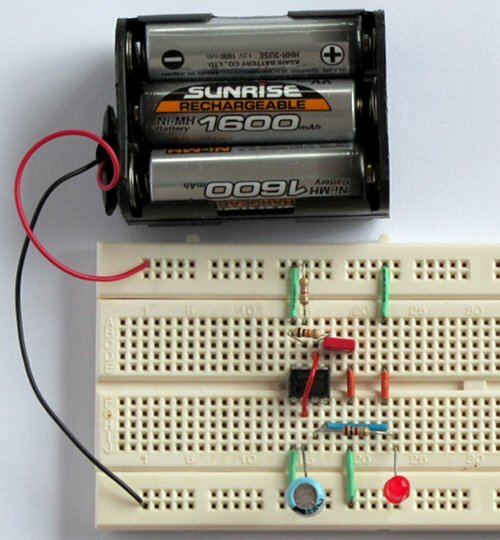 If you are sure that your circuit is correct, connect the positive lead of the 9V battery to the top rail and the negative lead to the bottom rail and watch the LED flash on and off. Try a different value capacitor for C1 to see the rate that the LED flashes change. E.g. try a 10uF capacitor to see the flash rate speed up.